Dr. Amanda Pawley near the base camp on Mount Everest. Every day, doctors around the world courageously dedicate their lives to conquering medical hurdles. For Dr. Amanda Pawley, spending four months at Mount Everest’s base camp tending to climbers, trekkers and locals – without the aid of technology or electricity – was the ultimate test of her ability. Amanda always dreamed of seeing Everest, “It was on my bucket list,” she says proudly. As a natural athlete, who was born to be outdoors, she jumped at the opportunity in the spring of 2000 to visit one of nature’s greatest marvels. 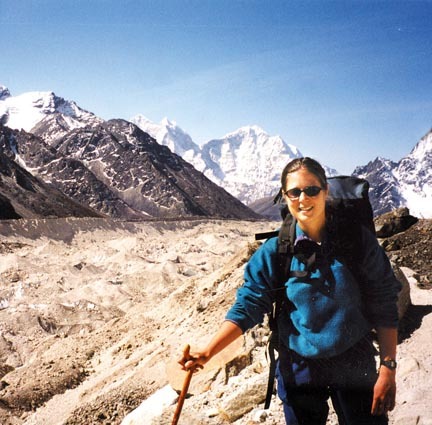 Shortly after her medical residency, which she completed through the University of Calgary in 1998, Amanda headed to the Himalayas in Asia to work as a volunteer doctor on behalf of the Himalayan Rescue Association of Nepal (HRA). Over the next four months, she and another female doctor from Colorado, would serve as the only doctors on the mountain with the exception of individual climbers who brought private physicians. However, Amanda says that the majority of climbers, trekkers and locals relied on her and her co-doctor to tend to their medical needs. On top of the added pressure of having to treat high-risk explorers, Amanda also held the responsibility of caring for the local mountaineers or Himalayan na ives, known as ‘Sherpas,’ a group who otherwise went without access to medical experts. In addition to the high volume of patients, gone were the modern conveniences Amanda was used to. Without the ability to run blood checks or other medical tests, she and her fellow colleague relied solely on a “device to check oxygen” and a “Gamow bag,” which is literally a bag used to mimic ground-level air, Amanda explains. And at such high altitudes – according to the HRA, Everest’s base camp is 1,000 metres higher than the highest point in Europe – the Gamow bag was a necessity. Amanda says it was not uncommon for climbers and trekkers to experience trouble breathing. Because of the extreme altitude and the lack of oxygen in the air, “the brain swells” or “the lungs can fill with fluid,” she explains. In such a scenario, the Gamow bag would be pumped with air and explorers, who were unable to breathe, would spend the night in the bag until they had enough energy to trek down to ground level. And with the thin air making it highly unlikely and extremely dangerous for a helicopter to fly to the base camp, the Gamow bag was often the only solution for wounded or sick explorers. 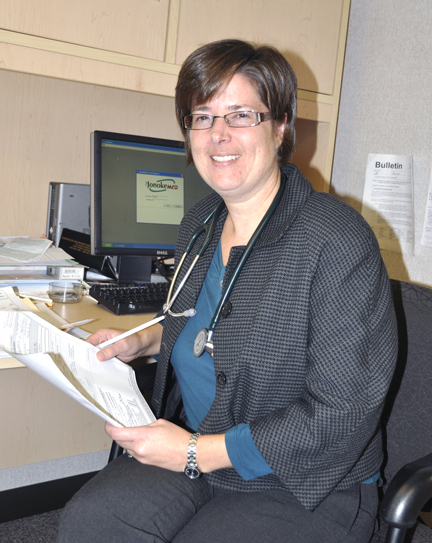 Dr. Amanda Pawley in her office at Medical Associates of Port Perry. Today, Amanda’s days working on the world’s grandest mountain are a distant memory. And while Port Perry certainly boasts its own unique scenery, it’s certainly a far cry from the extreme nature of Everest! While she always aspired to be a doctor, Amanda was initially drawn to a different kind of clientele. “I loved animals so I wanted to be a veterinarian,” she says. However, tending to her university boyfriend, who at the time was sick in the hospital and requiring surgery, changed her vocation. “The doctor was not communicating well with us at all, I thought I could do better than this!” she says. Amanda went on to complete her undergraduate degree in Life Sciences, her masters in Pharmacology (medicine research) and her MD in 1996 at Queens University. All the while, Amanda says she knew her ultimate goal was to become a family doctor, “I wanted to know my patients and I wanted the freedom to do different types of medicine,” she explains. Having grown up in Quebec and enjoying the variety of extreme sports, like downhill skiing and mountaineering, that the landscape allowed for, Amanda says the opportunity to work in Calgary, Alberta, was even more enticing. Before Amanda, her husband Danny and her two children came to settle in Port Perry, Amanda spent nine years in Calgary completing her medical residency and opening up her first practice with another doctor. She jokes that she initially came to Calgary with the prospects of finding herself a cowboy, but settled for her husband who was a “mountain boy.” After meeting through mutual friends, the two were married and had two children while residing in Calgary. In 2007, the family moved to Port Perry. Amanda says, upon her arrival she headed straight to the Medical Associates of Port Perry in hopes of joining the acclaimed team of ‘docs.’ “I literally showed up one day and said, ‘Hello, I want to work here,” she says with a laugh. Amanda says the “multigenerational” nature of her work is also a huge draw. Working with children, their parents and their grandparents, she explains, is one of the greatest aspects of working in family medicine, “I love getting to know people and their stories,” she says. After all, focusing on family is of utmost importance for Amanda. While she loves working in the hospital, in urgent care and in surgery, Amanda’s true happiness comes from spending time with her family. And with a new boat, a day on the lake with her husband, eight- year-old son and six year old daughter is her idea of heaven on earth. Though Port Perry may pale in comparison to the extreme mountains in Quebec, Calgary and the Himalayas, Amanda and her family are more than satisfied with their new home.